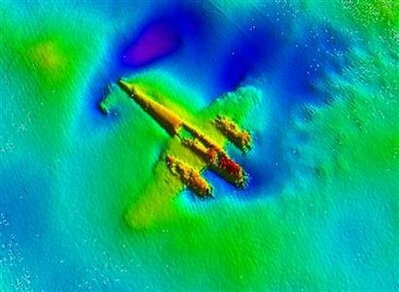 LONDON (Reuters) – A rare World War Two German bomber, shot down over the English Channel in 1940 and hidden for years by shifting sands at the bottom of the sea, is so well preserved a British museum wants to raise it. The Dornier 17 — thought to be world’s last known example — was hit as it took part in the Battle of Britain. It ditched in the sea just off the Kent coast, southeast England, in an area known as the Goodwin Sands. The plane came to rest upside-down in 50 feet of water and has become partially visible from time to time as the sands retreated before being buried again. Known as “the flying pencil,” the Dornier 17 was designed as a passenger plane in 1934 and was later converted for military use as a fast bomber, difficult to hit and theoretically able to outpace enemy fighter aircraft. In all, some 1,700 were produced but they struggled in the war with a limited range and bomb load capability and many were scrapped afterwards. Striking high-resolution images appear to show that the Goodwin Sands plane suffered only minor damage, to its forward cockpit and observation windows, on impact. “The bomb bay doors were open, suggesting the crew jettisoned their cargo,” said PLA spokesman Martin Garside. Two of the crew members died on impact, while two others, including the pilot, were taken prisoner and survived the war. “The fact that it was almost entirely made of aluminum and produced in one piece may have contributed to its preservation,” Garside told Reuters. The plane is still vulnerable to the area’s notorious shifting sands and has become the target of recreational divers hoping to salvage souvenirs. The RAF museum has launched an appeal to raise funds for the lifting operation.